Zhou Shiu Yon - the 24-year old Chinese refugee who became precious to many people across the nation through her many interviews with reporters - is finally free. She was released on May 28, 1998, after almost five years of incarceration. "God accomplished Zhou's release through a series of events we could have never orchestrated ourselves," observed Tim Palmquist of Voice For Life. For several months, Palmquist had been unsuccessfully attempting to orchestrate a meeting between internationally-recognized human rights advocate Harry Wu and the remaining refugees. In October of 1997, Zhou's former attorney, Randy Risner of Fresno, claimed that Wu had promised to visit the refugees in mid-November, and to assist them. By early December, Risner was no longer involved in the case, and Mr. Wu had not visited the refugees. After several attempts, Palmquist finally spoke to Wu on the phone. Wu said that he didn't know anything about the refugees, but that he would like more information. Palmquist sent him a variety of information, but Wu seemed only mildly interested. When Zhou and another refugee were moved from Bakersfield to Oakland, Palmquist contacted Wu and asked again if he would visit them, because they were now closer to Wu's hometown of Milpitas, near San Jose. However, various details continued to stand in the way of Wu's visit. In late April, for unknown reasons, the INS decided to move the two refugees from Oakland to another facility: the Santa Clara Department of Corrections in Milpitas-"coincidentally" just a few minutes from Harry Wu's home. On May 23, Wu visited Zhou for the first time (he also visited Wan Tin Chin). After this visit he boldly proclaimed, "I'm going to get her out." Over the next few days, Wu visited Zhou again several times, bringing along an ABC News reporter to tape an interview with her. Finally, on May 28, Wu had the privilege of taking Zhou on a short "freedom ride" from the prison to Wu's home. But Wu's actions tell only a portion of the story of why Zhou was freed. Mrs. Jones* had contacted Voice For Life first in January 1997, after reading about the refugees in a Focus on the Family publication. Jones first wrote to Jin Yue Yin, but she was sent back to China; so Jones asked Palmquist for another refugee's name. At this time, she began to write to Zhou. Through a series of letters and phone calls, Zhou became closer and closer to Jones, until she began to refer to her as "my American mom." The Jones family came to Bakersfield from Indiana in January 1998 to visit with Zhou. They also contacted the Immigration and Naturalization Service (INS) explaining that Zhou would have a home and a family if they would release her. Over the course of several months, the INS asked the Jones family to provide numerous intimate details about their lives, including their bank account balance for the past 12 months, etc. Finally, on May 28, the INS informed Jones that Zhou would be released if Jones would pay $10,000. Jones brought the money to her local INS office, while, halfway across the country in Milpitas, Wu prepared to pick up Zhou. Meanwhile, attorney Frank Muna, who had been paid thousands of dollars to represent Zhou, was completely unaware of Zhou's impending freedom. Muna's deceptions had caused Zhou to decide several months earlier to change lawyers, but Muna continued to refuse to release her files. "Now we can see that our God had no trouble working to free Zhou, in spite of Muna," Palmquist commented. "Zhou Shiu Yon has been freed, you need to come pick her up," was the brief message Wu left on Voice For Life's answering machine on the evening of May 28. The Palmquists' vehicle was breaking down, so Nat Craig volunteered to drive with Terri Palmquist to Milpitas, bringing Zhou back to Bakersfield for a few days. In Bakersfield, Zhou visited with many friends she had made while she was in jail. The highlight of her stay was Friday, June 5, when she was baptized! On June 7, a "welcome to freedom" party in her honor was held in the LifeHouse during the Grand Opening. Thanks to a few last-minute donations from Voice For Life supporters (and a very sympathetic representative of Southwest Airlines), Zhou flew with Terri and Caleb Palmquist from Bakersfield to Washington so that she could testify on Wednesday, June 10, before the House Subcommittee on International Operations and Human Rights. Wu had previously scheduled the hearing (before he had even met Zhou!) to expose China's forced abortion policy. Zhou told the committee that she became pregnant in China at the age of 19. The government would not allow her to marry, because she was too young. Because of this, she testified, "my pregnancy was illegal.... The government sent several guys to my home.... I hid in my room. Five men came to my door and broke it down (one of the men stayed outside as a guard). Once inside my room, they grabbed me and handcuffed me, then they took me to the hospital." She went on to describe the attempted forced abortion she experienced, along with her trip to the United States, and the eventual loss of her baby. "I kept thinking, 'I lost it... I lost it...,'" she testified. In her testimony, Zhou thanked her many "American friends": "they love me... they gave me to Our Lord." Her final words were sad, but hopeful: "if my baby had lived, he would be almost five today. I hope that I can have a baby again, I wish I can be a mother sometime in the future. I pray for it." Wu also testified at the hearing, along with Gao Xiao Duan, the former head of China's Planned Birth Control Office from 1984 to 1998, whose testimony exposed many previously-hidden details regarding the practice of forced abortion in China. "To all those injured women, to all those children who were killed, I want to repent and say sincerely that I'm sorry," Gao said tearfully in her testimony. Responding to the testimony presented during the hearing, Congressman Chris Smith said "despite all the demands and the white-washing, the truth is seeping out of repressive, barbaric China. Chinese officials are on notice that we will not stand idle while they continue to abuse, torture, maim, and kill their people." Unfortunately, Harry Wu would not allow Zhou to take a few moments in her testimony to inform the Congress members and reporters of the fact that our country continues to imprison Chinese refugees for years without cause; she couldn't even mention her friends whose years of incarceration continue to mount. Despite several attempts by Tim and Terri Palmquist to ensure that this was part of her testimony, Wu refused, insisting that such comments would not be consistent with the purpose of the hearings. 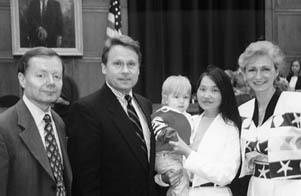 After testifying, Zhou proceeded to Indiana, where she now lives with the "Jones" family, who welcomed her into the family by legally adopting her. Her first name is now officially "Betty," the name given to her by friends she met during her years at the Lerdo Detention Facility near Bakersfield. With the help of her "mom," She is studying to become a medical transcriptionist. Betty's freedom is not officially permanent. She eagerly awaits asylum hearings in immigration court.